Thomas J. Shephard, Sr., is the senior principal at Neumiller & Beardslee. 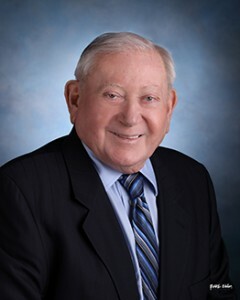 Mr. Shephard, in the course of more than 50 years’ practice, has developed particular expertise in the fields of public agencies, water agencies and water rights, flood control, transportation and church law. Prior to going into private practice, Mr. Shephard served as Deputy County Counsel of San Joaquin County. Currently he serves as either General or Special Counsel for a number of water agencies and other governmental agencies. Long active in water development issues for public agencies and private individuals, Mr. Shephard currently represents many public agencies, including the County of San Joaquin as to water matters. Presently, Mr. Shephard serves as a member of the San Joaquin County Historical Society and Museum. He was previously Chairman of the Board of Directors for St. Joseph’s Hospital of Stockton and Chairman and Trustee of the San Joaquin County Board of Education. He has also served as President of the Greater Stockton Chamber of Commerce, the San Joaquin County Historical Society and Museum, the Yosemite Association, and as Vice President of the San Joaquin County Business Council. Mr. Shephard was born in Modesto, California, and attended school there through high school. He graduated from the University of California at Berkeley, with an A.B. in Political Science-Agricultural Economics and received his law degree from the University of California, Berkeley. He is a member of the San Joaquin County Bar Association, the State Bar of California, and is a Fellow of the American Bar Foundation. Mr. Shephard is rated “AV” (the highest possible rating) by Martindale-Hubbell, the standard directory of attorneys in the United States. He was admitted to practice in California in 1958 and is also admitted to practice before the U.S. District Court, Eastern and Northern Districts of California, the 9th Circuit Court of Appeals, and the U.S. Supreme Court.